"In an outdoor run at Chicago Animal Care and Control, James McLarty-Lopes cradles a pit- bull-terrier puppy in his lap. Tears stream down his eyes as the dog, named Shadow, wriggles in his arms and licks his face. .... Only eight months old, Shadow was the victim of a shocking act of cruelty, which is how she ended up in Chicago Animal Care and Control (CACC) and in the Court Case Dog Program. 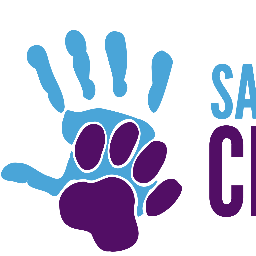 Coordinated by Best Friends and Safe Humane Chicago, the program assesses, trains and provides enrichment for canine victims of cruelty housed at CACC, with the goal of adopting the dogs out or placing them with local rescue groups. Police found Lucy in her previous owner’s home while responding to a domestic disturbance call. When police arrived at the house, 19-year-old Jamael Millsap told the police he had killed a dog in the basement. The officer went to the basement and found a grisly scene. Though gravely injured, Lucy was still alive. Millsap was arrested and indicted for aggravated cruelty, a felony under the Illinois Humane Care for Animals Act with a maximum sentence of 3 years in a state penitentiary. He forfeited ownership of the dog at the scene, which allowed McLarty-Lopes to adopt the dog to adopt Lucy a few weeks later." Curly snorts loudly like a pig.